We've rounded up the latest rental offerings via rental site Zumper to get a sense of what to expect when it comes to hunting down a rental in Chicago if you're on a budget of $1,400/month. Listed at $1,400/month, this studio apartment is located at 427 W. Surf St., #1. The building has on-site laundry. In the apartment, you'll get hardwood flooring, central heating, closet space and a ceiling fan. Good news for cat lovers: kitties are permitted. Per Walk Score ratings, the area around this address is a "walker's paradise," is very bikeable and has excellent transit. Next, there's this studio apartment over at 429 W. Surf St., #11. It's also listed for $1,400/month. Amenities offered in the building include on-site laundry. In the unit, there are hardwood floors, wooden cabinetry, stainless steel appliances and a dishwasher. Pet owners, take heed: cats and dogs are welcome. According to Walk Score's assessment, this location is extremely walkable, is quite bikeable and has excellent transit. 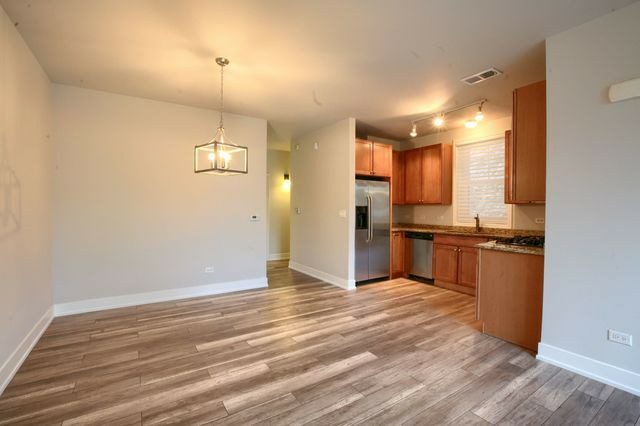 Here's a studio apartment at 1349 N. Dearborn St., #204, that's going for $1,400/month. The apartment features hardwood floors, a dishwasher and wooden cabinetry. When it comes to building amenities, expect on-site laundry. When it comes to pets, both meows and barks are welcome. Walk Score indicates that the surrounding area is a "walker's paradise," is very bikeable and boasts excellent transit options. Located at 4010 S. Oakenwald Ave., #1, here's a one-bedroom, one-bathroom condo that's listed for $1,400/month. Building amenities include garage parking. In the apartment, you'll get air conditioning, hardwood flooring, a dishwasher, stainless steel appliances, in-unit laundry, wooden cabinetry and bay windows. Good news for cat lovers: kitties are welcome. Walk Score indicates that the area around this address is somewhat walkable, has some bike infrastructure and has some transit options. Finally, here's a one-bedroom, one-bathroom apartment at 485 N. Seeley Ave., #6 that's going for $1,400/month. Apartment amenities include hardwood flooring, central heating, in-unit laundry, wooden cabinetry, built-in storage features and a ceiling fan. For those with furry friends in tow, know that cats and dogs are permitted on this property.